When I first heard of Digimon, I was one of the ignorant ones. I mocked it for having "mon" all over the place and because I had already been a Pokemon fan. It wasn't until I actually watched it that I saw that it had everything the Pokemon anime didn't. Threatening villains, good character development, no favoritism toward a specific mascot. And of course... this precious baby. She was actually the character who got me into the series. That one episode where she gets sick and the other characters try to find medicine for her. My heart used to explode into a puddle of fluff when I saw her, and her dub voice actress, Lara Jill Miller, will always be one of my favorites. In general I was most fond of the first season. It was this big adventure set in a vast, mysterious world. The size of the cast of characters was unheard of for me at the time. I had to remember the names of eight kids, eight basic mons and whatever they transformed into. It took me forever to remember Mimi's name. At the time I had no idea about the kind of editing and dialog changing that went into dub anime, so I didn't think anything of it, but now I kinda cringe when I hear about puppies and kittens that never really existed, and the cheesy one-liners get kind of annoying, but for the first season I like the dub, particularly because of the voice cast, even if this is their idea of awesome fight scene music. Then came Digimon Zero Two, and suddenly our familiar friends are older, most of them are supporting characters in favor of a new bunch who are likable but not as memorable. Gone is the adventure aspect and instead our kids hop to and from both worlds on a daily basis. One thing I really liked about this was the idea of a human villain, particularly a kid with a Digivice just like our heroes. THIS is one that I would without hesitation watch the subbed version instead, even though it did better with action music than the first season. This one was REALLY turned into a gag dub, and while Daisuke/Davis was a loser in the original, having him be a bed wetter is a bit much. And those one liners? "Look at this land of fire. It's like the movie... Land of Fire." Davis: Is he here yet? T.K. : Izzy? No, we're waiting for Ken. HOW DOES A LOCKER GO MISSING?! I did like this season, but it was anything but perfect. For one thing they threw in this lovecraftian nonsense story in one episode and never even addressed it. They had Chiaki Konaka as a guest writer so of course he'd do something like that. The ending is also one of the most controversial in history, and not just because of the "everyone's an adult" epilogue where Matt defies his love of music to become an astronaut. 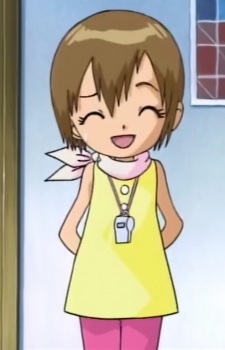 The third season, Digimon Tamers, abandoned its previous characters and setting in and brought Chiaki Konaka as a full-time writer. The result? About as close to Evangelion as you can get in a show that's still kid friendly. Yep, we're talking dark and edgy deconstruction time. The main character, Takako, is anything but the adventure seeking goggle-heads we saw in the past seasons. He's a very timid guy, as per tradition of deconstruction protagonists. "Not your little brother's Digimon" this thing was advertised as, and of course they pulled out all the stops to make this as edgy compared to the original as possible. In the previous two seasons, when a Digimon dies its data gets restructured into an egg and it can be reborn. Not in Tamers. Even if the opponent doesn't absorb the data there's no rebirthing for fallen Digimon. This season actually starts out more like a slice of life show. The cast stays in the real world for most of the time and we see their daily lives dealing with keeping the secret of Digimon from their parents, dealing with enemy Digimon that cross into the real world. It's not until around the second half that the cast even goes to the Digital World, and if you were expecting a fantastic realm full of adventure, prepare to be disappointed. It's a barren wasteland. The only thing really eventful is the cruel twist that takes place in the Digital World, which is where people say the show really "gets good". For those who don't know, but don't care about spoilers. One of the main characters, a young girl named Jeri/Juri, ends up having her partner Digimon killed and absorbed right before her eyes. She spirals into an understandable fit of despair and ends up being kidnapped by the eldritch abomination that is the final enemy in the series. She spends about twenty episodes trapped inside it, being repeatedly mind raped so that her despair can fuel this thing. In the original she finally breaks and tries to commit suicide. Because kids shows! I used to hate her guts, now I just hate the show for putting her in that position. And then there's Ryo. He's a character who suddenly shows up in this series, with no real backstory or explanation for why he's here. And the reason for that is because kids in Japan would know him from Digimon games on an obscure system called the Wonderswan. Apparently he crossed over from the dimension that the first season takes place in and is now stranded in Tamers-verse. Naturally American viewers would have no idea who he is or why they felt the need to insert him in the first place. The fourth season is probably the most controversial thanks to one particularly unique decision. There are no partner Digimon, instead our protagonists have these things that are like Digimon shells that let them transform into Digimon and do the fighting themselves. This season returns to form, as we have our interesting Digital world that are protagonists are stranded in, our goggle-head is of the hotheaded characterization again, and Digimon turn into eggs again. Along for the ride are the two most annoying creatures in the franchise history, who are pretty much the personification of the Japanese Boke and Tsukkomi Routine. They serve no real purpose other than exposition and comic relief. This season I could say has the most genuine problems. First and foremost being its female protagonist, Izumi/Zoey. I don't like to call female characters useless, but when you've got your cast actually fighting, at least let her win more than one battle, and not just a designated girl fight. It's a tradition that when a new evolution is achieved, the Digimon wins the fight. This girl does not, and the secondary main guy has to rescue her. It seems that her only purpose on the show is fanservice. Both of her Digimon forms are rather skimpy and she gets a few imagine-shots of her in skimpy bikinis. Secondly is one of the upgrades to the main two get, which requires the other characters to channel their power into them. In other words, only the main two get to do anything for much of the show... and not much either, thanks to the travesty that is the infamous Royal Knights saga, where they get beaten down for eight episodes in a row by these two irritating villains. I think that saga might be even more infamous than Zero Two's ending. I haven't seen any of the future seasons, so I can't really speak of them. Now it seems we're going to be returning to the original universe. "the characters of the first Digimon Adventure anime are returning "
All. I. Needed. To. Hear. First Sailor Moon, now Digimon? Japan really wants to bring back people's childhoods. I came into Digimon pretty early as a kid (I think I started on episode 3? the one about Matt) while I liked it, I didn't really think it could take Pokemon's place in my heart. HAHAHAHA boy was I wrong. I was such an embarrassing fan for Digimon. This was the first show I wrote fanfiction for. the first time i was attracted to an animated character (Izzy, then Davis *cough*). The first show I made a fan-site for. the first time I saw an anime movie in theaters multiple times. I even still have a Taco Bell kids meal bag that had their pictures on it when they were releasing the toys and cards. And dont even get me started on fanart. I think I even got in trouble in middle school because i was drawing too much digimon. But Adventure (and even Zero Two) will always have my favorite cast of characters, So I'm really excited about the reboot special. I really need to catch up on the other seasons. I know Digimon Xros is kinda good, the sequel not so much, but the lead Tagiru is kindof adorably obnoxious. I hated what I saw of Digimon Savers tho. They are actually rebooting Digimon next year! Well not really rebooting, but making a new anime, I'm so excited! I heard that Joshua Seth (voice of Tai/Taichi from the dub) expressed interest in reprising the role if Tri gets dubbed. That would just be nostalgia bliss. And now the first Tri movie is out and I gotta say it was a pretty nice cruise back into a beloved series. Only three minor things bugged me. character designs. They look kinda bland and samey, with some of them shown in multiple shots pretty much having the same expression a lot of the time. Of course this isn't a kids shounen adventure series anymore. This movie series is made for the adults who grew up watching Digimon, so it makes sense that the art style would look more like something out of a seinen high school anime. The second thing is the fact that the Zero Two characters were shown to be canon, but no one ever mentions them, not even the two characters who were protagonists in both the first and second season. It's like the S1 cast doesn't even acknowledge that they exist. The third is that the movie has a great deal of shippiness to it. Tai/Matt/Sora connection gets hinted at. Kari has the power to motivate Tai's entire soccer team (and they get annoyed when he doesn't bring her to their game). The cliche "She's just a friend" type of situation happens a couple times with T.K. calling a friend or two to see Matt's concert, and everyone immediately assumes they must be girls. And finally, Izzy is blatantly shown to have feelings for Mimi. I think after Legend of Korra my bag of tolerance for shipping and romance has snapped. This movie starts off kinda slow but it's a good thing I'd say, as it lets you get a look at what their ordinary lives are like. I do like that they still take their Digivices with them everywhere, even if it doesn't serve and purpose. It's nice to see how many of these characters have changed and how many haven't. Our leader in particular has become much more mellow and less gung-ho, which is nice. One thing I like about the movie is that it takes a lot of aspects about the previous seasons more seriously. Digimon attacking the city not only cause a lot of destruction, but the public is very aware of it, and it brings conern that even their friendly Digimon would be treated as threats or enemies. Looking forward to the next part, whenever that happens. I like that they gave Taichi a more mellow personality that likes to see things from both sides, the everyday human's and the digimon's, because as we all know from the 02 epilogue Tai grows up to be a diplomat XD so I guess they're trying to make a good midquel/sequel that still ends with the out of left field happy ending that 02 gave us. Jou & Mimi with Rosemon & Vikemon! also note Paildramon is at the bottom there so maybe the 02 kids will show up in that?? I found a relic from my childhood! 1999, such a long time ago. I got this at a Walmart just before a family road trip. The shaker is unusually sensitive, enough that I was able to just sit it upright on the arm rest of the seat next to me, and it would move on its own. I haven't touched this thing since around that time. Before the first episode of Season 2 aired on August 19, 2000. I've had other Digivices since then, but I never went back to the original until now. The one I really miss is the translucent D-3 model, which had an amazing amount of content for such a little thing. It actually had things like cut-scenes with music, some kind of plot and lots of little features that even the previous model D-3 didn't have. It had Terriermon as an unlockable character, both Golden Armor forms, you had to rescue each of the S1 Digimon along the way and they came back to help during the final battle, which was against Diaboromon from the War Game movie. And if you were using Veemon/Wormmon or Agumon/Gabumon, they would go Imperialdramon Fighter and Omnimon respectively just for that battle. I remember strapping it to the rumble pack of the Dreamcast. There's a part in Sonic Adventure where you get inside a machine that launches you at bowling pins and the rumble pack shakes continously. That's better than a Gameshark. » Digimon Sailor Moon Cross over idea.